One thing leads to another: with Restore Cootes' founding focused on Cootes Drive's negative impact on habitat, further historical research deepened our understanding of the massive changes wrought on this special place by human development. Our selected chronology touches on some key moments in the pursuit of restoring the natural connections lost to car-centric development, and the amazing opportunity we are presented with today to gain ground, literally, for rehabilitating the ecology of lost floodplains and specialized habitat. May 2003 - An article in PIRGspectives (OPIRG McMaster) brings more attention to the expansionist parking plans of McMaster: “Despite the University's ‘Balanced Transportation Strategy’ stated goal of maintaining parking supply at the current level of approximately 4500 spaces, there are plans to build an $11.5 million parking structure on campus as well as plans for a parking area at Cootes and Olympic Drive in Dundas.” These projects never come through due to push back from Dundas residents concerned with loss of turtle habitat. McMaster eventually builds a satellite lot on Ward Avenue. May 2005 - Article in PIRGspectives about McMaster parking and Cootes Paradise "Wondering Why the White Bus" - "it must be said, a lot of potential down there in zones 6 and 7. The flood plain, of course..." and mention of Campus Master Plan. 8 April 2009 - Randy Kay presents The History of Cootes Drive to Dundas Historical Society. 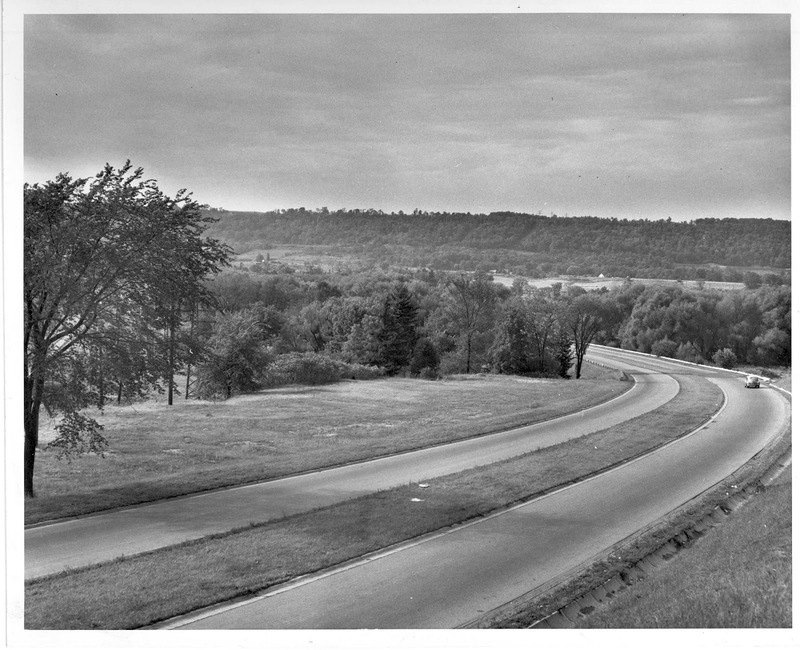 "From the standpoint of Dundas this new highway was not a necessity" (Dundas Mayor Manning) - follow-up research on the history of McMaster's parking reveal that Lot M was until 1963 part of the RBG's Coldspring Valley Nature Sanctuary. 18 April 2009 - Work Begins on Combined Sewer Overflow Tank, South-West section of Lot M closed (still closed April 2014) - RC first noticed that closing this large section of the lot had no negative impacts on parking. 30 March 2011 - “We will be cutting back the parking surface perimeter several feet on the west end that will increase the buffer zone between the parking lot and the creek. More importantly we are committed to install a parking lot that is permeable...I think this will be a huge improvement in storm water management delivering less water runoff and that that is delivered to the creek will be substantially cleaner than it is currently done. 3) Create a long range plan to phase out parking in the lots west of Cootes Drive. 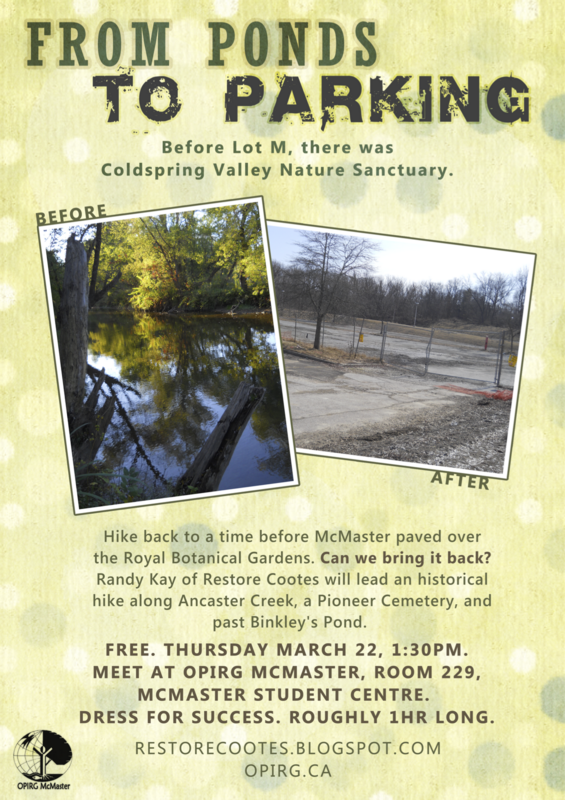 14 December, 2011 - First RESTORE COOTES “History Hike” into West Campus. Randy takes a small group of Undergrads for an inaugural history hike, first of many over the next few years. no money be spent on resurfacing the section of Lot M marked for permeable paving. 2 April 2012 - Restore Cootes/Transportation for Liveable Communities meeting with City (Gary Moore, Councillor Brian McHattie) and University - Terry Sullivan (Parking and Security), Gord Arbeau (PR), Mohamed Attalla (Facility Services) - and Wayne Terryberry of President’s Advisory Committee on Cootes Paradise (PACCP) (invited by RC) - RESULT: University agreed to send Lot M issue to PACCP. Moore tells us that city money for parking lot not tied to repaving. 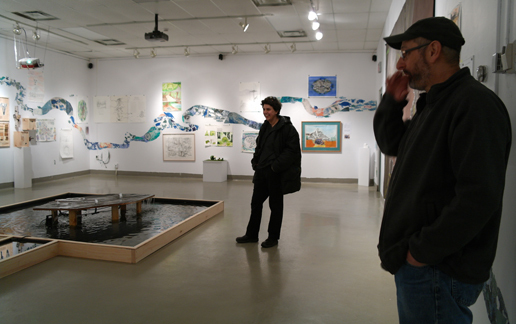 February 2013 - Mapping Paradise: McMaster student art show and visiting professor Gregg Schlanger, organized by McMaster Art Prof. Judy Major-Girardin. Schlanger surprises us by making his central art work based on Lot M. Vaults to the top of our favourite artists list! August 5, 2013 - “The engineer is completing diagrams, which will be sent to Tender for a contractor and the work beginning mid September.” E-Mail from Terry Sullivan, Director of Parking. April 2014 - 30m Buffer begins without any communication from McMaster. This is a very significant advance considering McMaster was initially reluctant to undertake it at all. We will now watch the progress and continue to support the creation of McMarsh in the section of Lot M closed since April 2009.